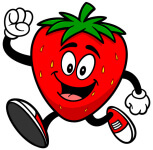 The 4th Annual Strawberry Festival 5k will be held Saturday, June 23, 2018, 9:00 AM at the picnic shelter in the rear of London Baptist Church, 1440 St Rt 665, London OH. The route will begin and end on the scenic Roberts Pass Bike path which is at the rear of the church. Runners will begin the race at 9 AM and the walkers will begin 9:10 AM. Children in strollers are permissible but no pets please. Water will be provided along the route and a healthy snack provided at the end of the race. Pre-registration may be done by mail or on-line. ​Same day registration available 8AM to 8:45AM at the Picnic Shelter; race shirt may not be available on the day of the race. Make all checks payable to London Strawberry Festival Royalty Program. ​There is a $25 fee on all returned checks. Please, note the start time is 9 AM NOT 10 AM as inadvertently printed in the program book. Thank you to our race host, London Baptist Church.